It happens to all of us, but at some time or another you are going to have to leave the sanctity of your sewing room and go on the road. Well this new PJ's collection has got you covered. PJ's Travel Accessories addresses all of your traveling needs with five fun projects. 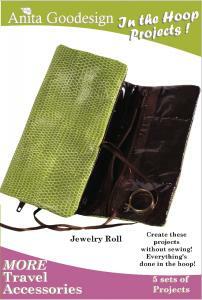 You will be able to make a sewing kit, document holder for your I.D., money belt, makeup case and a utility bag. As always, all the projects are made in the hoop with no sewing required. This could be just the collection you need so you can make that perfect gift for that special someone in your life that never stays in the same place for very long.